The Guggenheim Museum recently approached Malcolm Grear Designers for a limited-release of the iconic image the studio created for a poster in 1969. This depiction of the museum's landmark building has been re-released to celebrate Frank Lloyd Wright’s 150th birthday and the 80th anniversary of the Solomon R. Guggenheim Foundation. 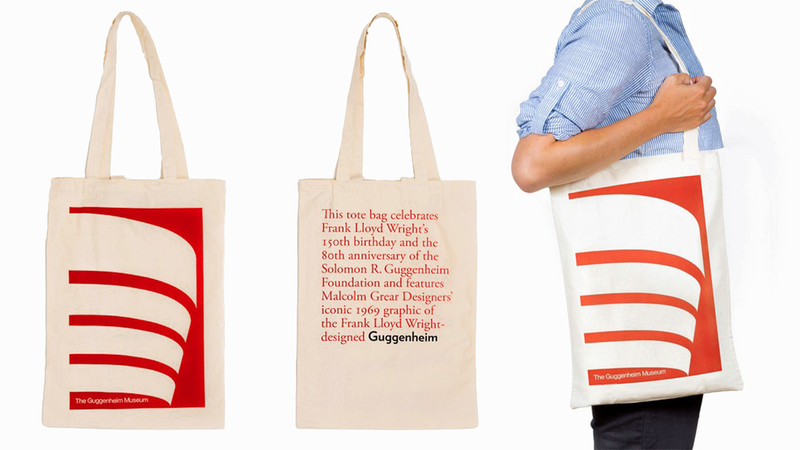 This canvas tote bag is available at the Guggenheim Store. For twenty one years, from 1969-1990, Malcolm Grear Designers designed all of the catalogues, brochures, posters, invitations, calendar of events, newsletters, stationery, gift bags, and promotional items for the Guggenheim Museum.